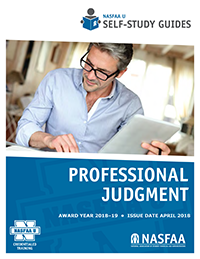 Professional judgment (PJ) is sometimes viewed as one of the more challenging aspects of Title IV program administration. There are both explicit and implicit guidelines that must be followed in relation to other aspects of Title IV federal student aid administration. This guide will teach you guiding principles and assist in their application on your campus. General documentation requirements applicable when exercising PJ. Understand how to exercise professional judgment in need analysis, through exploration of concreate examples. Understand how to apply professional judgment in originating Direct Loans. PJ documentation requirements applicable to SAP and PJ.